Savvy Maps :Produces maps of spreadsheet models to help the auditing or understanding of models. These maps categorize the contents of the model into unique formulas, copied formulas, numbers, text labels and error cells. Professional spreadsheet auditing firms (e.g. accounting firms) use these maps as a powerful way of quickly spotting errors and to help them to focus on the critical areas of a model. Example Scenario : "A major investment bank has sent me an Excel model. My company has to check if it is doing what it should. The model is 7MB in size. I haven't a clue where I should even start". Savvy solution : "Run Savvy Maps and then you will be able to estimate how long this will take. You will have a Savvy Report to see exactly where to concentrate your logical checks. When looking at the Excel Model further usage of the Savvy Utilities will help you uncover other areas of the model such as hidden areas". Example Scenario : "My client has sent me a Financial Pricing Excel Model to look at. He says that most of the formulae are copied, hence it should be easy to review." Savvy solution : "Run Savvy Maps on the model. 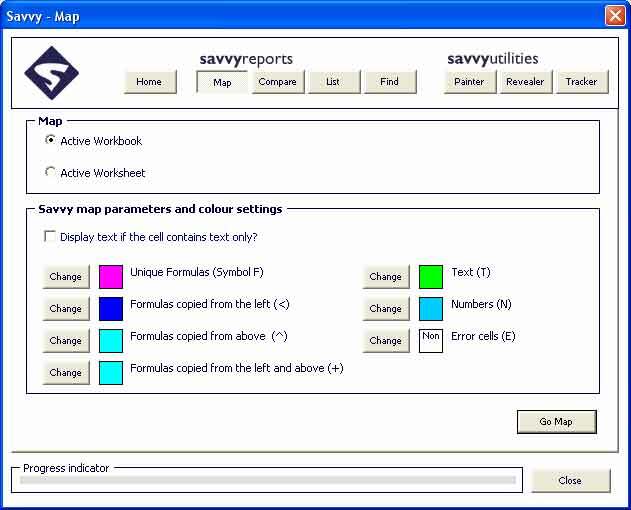 Using the Savvy Map Report you can identify the unique formulas in your model; by focusing your attention on unique formulas as opposed to copied formulas you will be able to reduce by over 95% the number of cells that needs to be examined." Example Scenario : "Our derivative trading model was given to the new junior analyst for updating. The Excel model timeline spreads over 100 columns. We have unique formulae in column A and the other 99 columns are copied across from this. I need to check the updates made." Savvy solution : "First run Savvy Maps and check to see if the updated model maps have any irregularities in the timeline. If the analyst has forgotten to copy the updated unique formulae across to the other columns this will show up. As a second check use Savvy Compare to see the differences between the original and the updated models". Example Scenario : "I am looking at a valuation model for a multi-million dollar transaction. The valuation feels a little high since the client played around with the model. The finance director mentioned the CEO may have overwritten some of the calculations on the Cashflow worksheet with numerical inputs"
Savvy solution : "Use the Savvy Map Colour setting to highlight only numerical inputs and then Run Savvy maps on the cash flow worksheet and look in the Savvy Map report for irregular patterns in the timeline, this will help reveal issues within the Excel model." Example Scenario : "My client is looking for assurance over their Excel model". Savvy solution : "By showing your client that you use excelSavvy you will give them the confidence that you are employing a rigorous approach in providing assurance. 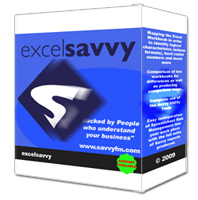 Provide your client with a high quality service by using the full range of reports and tools available in excelSavvy and by combining this with the Savvy methodology for reviewing spreadsheets." Excel models are normally constructed by creating a formula and then if necessary copying that formula to the right or down the worksheet to get a block of formulas; the cell with the unique formula is the first cell in such a block. You can massively reduce the time required to review and understand Excel models by focusing your efforts on cells with unique formulas. Cells with formulas copied from the left. These cells contain formulas and were created by copying the cell immediately to the left. These cells contain formulas and were created by copying the cell immediately above. These cells contain formulas and were created by either copying the cell immediately to the left or the cell immediately above. Cells that contain error values e.g. #DIV/0!, #REF!, #NAME? or #NUM!